Can I have same day delivery? If it is humanly possible the answer is yes – of course! Call 020 7787 1100 with all your urgent details. Can I use recycled paper? 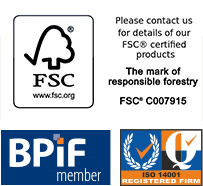 All our stock papers are FSC accredited with part or fully recycled content. Can I transfer my artwork over the internet to Scanplus? Yes – see our Upload page or use an external file transfer facility (wetransfer.com etc). Yes, we accept all major credit cards. Please visit our Payments page to make a payment. What software is best to use for creating general artwork? Adobe InDesign. Quark Xpress. Adobe Illustrator. Adobe Photoshop. All can be saved on completion in PDF format. What if I don’t have any of the programmes above - what can I use? Word. Excel. Publisher. All saved as PDFs but please talk to us first! What is press ready PDF atwork? High resolution (300dpi), with trim marks, 3mm bleed, supplied in single page format and saved in CMYK (not RGB) with all fonts embedded. In most cases we prefer to receive artwork in PDF format. PDF/X-1a is an excellent ISO Standard for graphic file exchange, it ensures that fonts are embedded and all images need to be CMYK or spot colors. Do you supply dummies or sample packs in advance of ordering? Yes. Please contact a member of our sales team now. Can I see what my job looks like before production run? Yes. There are a range of proofing options available.